Now you can validate your e-return using Aadhar Card. CBDT recently announced that income tax assesses filing income tax return online no longer require to submit paper acknowledgement by post. Aadhar based verification is enough to validate this document. New column is introduced in ITR form for 2015-16 for Aadhar card. 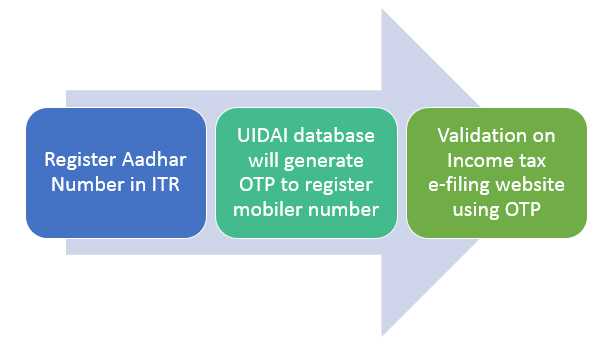 For online e-return filing assesses can provide Aadhar card which needs to be validated on official income tax site using OTP (one time password). You can download ITR form for 2015-16 from income tax website. New process of validating Income tax return by aadhar card is given below. 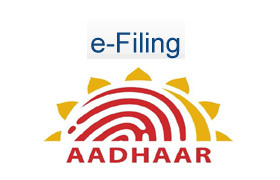 E-filer first needs to register his Aadhar Number in ITR. System will check and instruct UIDAI database to send OTP to register mobile number of taxpayer. Tax payer need to validate this OTP on e-filing website while filing return. Also Read – Home loan HRA and your Taxes! This is new way to verify returns. This facility will be available on income tax site soon. Tax payer will be happy as they need not to do paper work for sending ITR acknowledgement to CPC Bangalore. As per current process tax payer need to send this acknowledgement by register post or speed post to CPC Bangalore within 120 days of filing tax return online. Elimination of paper work is very good move and it will ease entire process. It will also help tax payer by generating tax refund faster. Tax payer always had apprehension that hard copy of ITR-V will be received at CPC or not. Although they are sending ITR –V by speed post or register post they often receive a message from CPC that ITR-V is not received. This step will not only help tax payer it will also help Income tax department by removing non value adding activity of physical processing of Income Tax return.